Often times we become so familiar with something, yet know nothing about the history of how it came to be. We feel this is the case with a vehicle wrap. As the popularity of these thin films continue to expand, we thought we would offer up a little history on how they came to be. Vinyl films can be applied to many surfaces. There are specific types of films that are best for vehicle application. The curves and contours of a vehicle are quite different from a wall or flat surface. Vehicles are exposed to weather, external elements and more. All that being said, there have been continuous improvements and product innovations to bring the vehicle wrap to wheret it is today…. Although vinyl itself was accidentally discovered (or invented) in the 1920’s, the production cost did not make much sense until the 1980’s. As the product cost went down, the experimentation of what you could do with it increased. It all started with the taxi in Germany in the early 1990’s. Up until the 1990’s the only real and obvious option for changing the color or branding a vehicle was a good old paint job. That all changed when Kay Premium Marketing Films was asked to produce a film that could turn a car into a taxi. Taxi’s, by German law, were required to be completely beige in color. Again, painting was the only obvious option and solution….well at least if you wanted to be a legal taxi driver in Germany. However, painting these taxi’s the boring beige color posed a problem later down the road when one sought to resell the Taxi. KPMF produced a film that could be applied to an entire vehicle (or taxi). This film could then be removed 3 years later and restore the vehicle back to it’s pre wrap condition. The first commercial wrap is stated to have been made for a Pepsi Bus in 1993. From there commercial wrap advertising began to spread quit rapidly. Although these new commercial wraps were popular and rewarding for business, difficulties were discovered. These problems had to do with adhesion and air pockets under the vinyl, which affected the longevity and appearance of the wrap. Innovators, like 3M, began to advance and develop technology to transform early vehicle vinyl films into durable, long lasting, high quality films. Aside from solving the air bubble problem, proprietary manufacturer blends allowed for better conformability. Continued advancements in both films and printing equipment have brought vehicle wraps to were they are today. 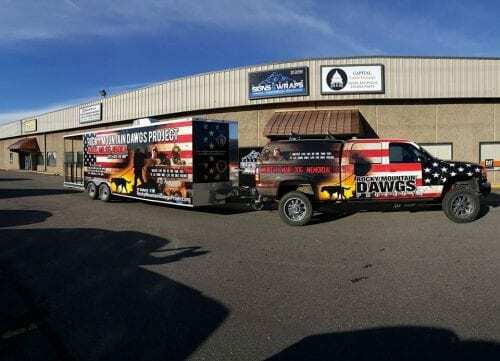 As the vehicle wrap began to evolve as the way to to change the color of a vehicle and even add company graphics and logos, so did the demand for better equipment. Printers are a big part of a commercial advertising wrap. The advancement of large format printers have expanded what you are able to do do with a vehicle wrap. The products, materials, and equipment use to produce a vehicle wrap, whether color change or graphic wrap are extremely important in the overall quality and life span of the vehicle. Colorado Signs, a 3M certified graphic Installation Company, has nearly 2o years of experience in the industry. We use the industries best films, inks, printers, equipment, and practices to produce wraps that last. Have a question or need an estimate on a vehicle wrap? Send us an email, or give us a call. We are happy to provide you with the most up to date information.